Our Daffodil Crazy Combo Pack – 100 Bulbs and planter consists of 50 Daffodil Yellow Trumpet (Narcissus tazetta) bulbs, 50 Daffodil Mixed (Narcissus tazetta) bulbs and a bulb planter. Daffodil Yellow Trumpet and Daffodil Mixed are by far the most popular Daffodils. Yellow Trumpet Daffodils are a blend of classic yellow blooms. Daffodil Mixed is a good mix of the best performing varieties including trumpets, cups, butterfly and jonquils to ensure a long lasting and beautiful Springtime display. The traditional symbol of Spring, Daffodils are ideal for pots, tubs and the garden. Leave in the ground year after year and the bulbs will multiply and create large clumps of colour. Excellent as a cut flower to bring Spring indoors, Daffodils look great when planted under trees. Ideal planted in clumps, either on their own as a feature, in a mix with other Spring flowering bulbs, or with a border of muscari or spring stars. Better suited to the cooler climates; best treated as an annual in areas that do not get a cold Winter or have a short hot Spring. General Information: Suitable for Mediterranean and temperate/dry climates. 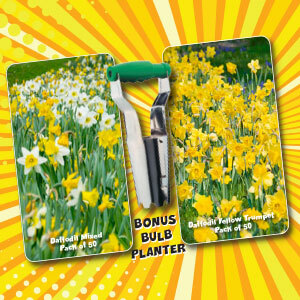 Daffodils will generally only flower from round mature bulbs. If you plant them too shallow they are prone to ‘spilt up’ into side bulbs too readily to reach maturity. Deeper planted bulbs appear to stay healthier, and split less frequently, thus producing more flowers for many years. Watering: After planting the daffodils give them a thorough watering, but do not water again until the foliage starts to appear. Natural rainfall should be sufficient. Keep bulbs moist during dry spells in autumn and late spring. They do need water during their growth and flowering. Can tolerate frosts. Fertilising: After flowering has finished, apply light amount of blood and bone or complete plant food. If you have poor soil, sprinkle an all-purpose feed after flowering. Soil: Well drained soil. Lifting & Storage: If the daffodils are planted in soil with good drainage, the bulbs may be left in the ground and divided every 3 years. If you prefer to dig them up, spent flowers should be removed and foliage allowed to die off naturally. Once the daffodils leaves have died right down, they can be lifted and stored in a cool, dry, airy place. Pests: Use a little snail bait regularly during growing period. Tips: They look beautiful mass planted in the garden. Daffodils can range in colours from yellow, white and pink. Smaller varieties need not be planted as deep. In warm climates plant all varieties slightly deeper than recommended. 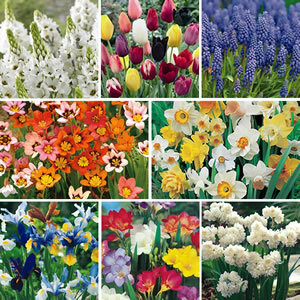 Different varieties flower at different times so mixed Daffodils flower over a longer period. Can be grown in pots, window boxes. Do you have to lift the bulbs every year? It is not necessary to lift daffodils every year, probably every three years is enough. The best guide is that if a clump is not flowering very well, that is if flowers are becoming fewer and fewer, this means that the clump has become too crowded. You should definitely lift and divide them when they are dormant, usually at the end of summer. Lifting and splitting these bulbs up so they get a new lease of life. How do you store bulbs? When you lift daffodil bulbs put them into an open mesh bag like an onion or orange bag and hang in a cool airy spot in the garage or garden shed. Keep them there until March which is the time to plant them in the garden. Is it really necessary to wait until the leaves have died down before you lift the bulbs? It is important to wait until the leaves wither before you do anything with the bulbs. After a bulb has put out its flowers it will have shrunk to a tiny size, so if it is to flower next season it will need to be replenished with food in the form of starch. This is the purpose of the leaves, making food to build up the bulb to a decent flowering size. If you cut or mow down the leaves too early the bulb will not have grown enough. Six to eight weeks after flowering has finished you can certainly cut off the withering leaves. Why didn’t my Daffodils flower? They may be growing in too much shade, they prefer quite a bit of sunlight. They may have been planted too shallow, this causes splitting of the bulbs, which are then not big enough to flower, but will still produce leaves. The bulb may have been too hot in pots left in the summer sun. one formulated for bulbs or an azalea or camellia food will be fine. The best time to feed is just as the flowering is finishing and the leaves are dying off.